Paypal Currency Conversion Tool helps you find out the worth of your American Dollar (USD $) in Indian Rupee(INR). Log into your Paypal account. Click on the My Account tab. You will find “Withdraw” there. When you click on it, it opens a new screen – Withdraw Funds. Click on the option: “Withdraw funds to your bank account“. If you have a verified bank account it is displayed as default in the amount transfer “To” box. Right beneath it to you will find the Paypal “Currency Converter“. Click on it. It opens pops up a new window displaying the currency converter. This is the window that tells you exactly the equivalent amount Paypal is likely to consider at that point of time. Take a look at the screen shot for a detailed view. The Paypal office in Chennai is a development center and has nothing to help you. When I reached them while writing this post on 044 – 6634 8001, the receptionist there gave me this US toll free # 1 402 935 2050. Do not call them if you do not want to go through their IVR system that could take ages to reach their agent . You are burning your money. It is better that you mail them. I came across this site which seemed to have plenty of resources to learn more about Paypal. Good luck. 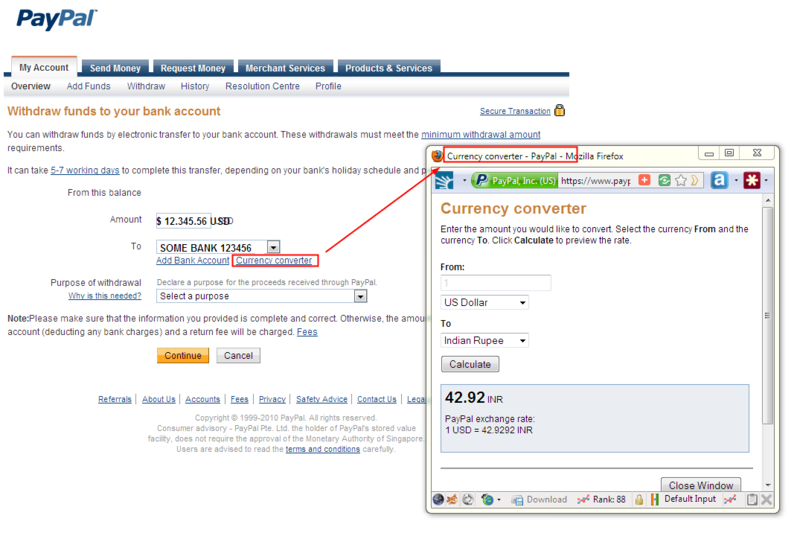 Hope this little info about Paypal Currency Converter helps you. If you liked this post, please pay it forward to others who do not know how Paypal deals with foreign exchange. I came across Mike Stratton on oDesk way back in 2009. He had then posted a project Increase Your ODesk Rating 5/5 – Fictional Story of Encouragement. The intriguing project title drew me to it. Leave alone the ranking and the money, Mike was talking about, it was for a noble cause. Besides it would help me assess my creative skills. Mike should like it enough to publish it on his site. I did not submit my bid immediately. I had to make sure that I had something to write about in Mike’s own words , “a personal story of encouragement/ empowerment”. I had to write a fictional story in about 500 words. When I woke up the next morning, I had the story outline. When I sat before my keyboard it took me something like sixty minutes to complete it. You can read the story here. Thank you Mike, for giving me that break. Please, leave your comment here to let me know what you think about Mike, his initiative and my story. from oDesk. (Emphasis mine).The undeniable underlining hope was that it would take me closer to a successful freelance writing career. I was yet to learn the tricks of the freelancing trade. I did not know then that I was wasting my time and effort applying for some of those ‘freelance content writing openings’ that were very clearly saying ‘DO NOT APPLY’. Surprised? Don’t be. The reason? Well, I think this buyer doesn’t need my attention because, this buyer is not willing to tell me how she is going to pay me and when she is going to pay me, if at all she is going to pay me.So, there you have a buyer, who is not “oDesk payment verified” and the ‘oDesk Buyer Facts’ has nothing to tell you, so what would you do?